I’ve been searching for The Blue Hawaii for about five years, and last week — while vacationing on the Big Island — I found it. 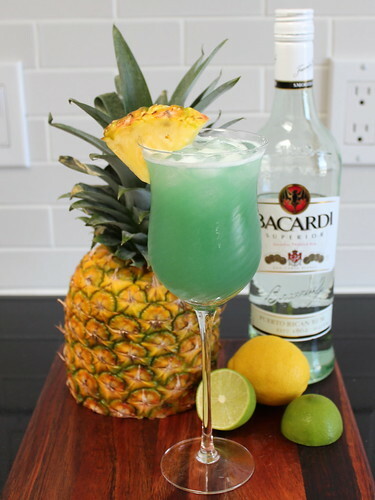 In this version of The Blue Hawaii, I lighten up the typical sticky sweetness of the drink twofold by substituting fresh lemon and lime juice and a spoonful of powdered sugar — so it dissolves completely and gives the drink a touch of opacity — instead of bottled sweet and sour mix, and using Cointreau (with a drop of blue food coloring to give the cocktail its trademark hue) instead of blue curaçao. Be warned: the pineapple juice is far-to-skilled at masking the generous amount of booze used in the libation — tread carefully with this one! P.S. Stay tuned for some non-cocktail recipes next week! Anything in particular you’d like to see? In a Mason jar (with lid, pint capacity or larger) or cocktail shaker, combine pineapple juice through powdered sugar plus 1 drop food coloring with a few cubes of ice. Cover and shake for about 30 seconds, or until sugar is dissolved and mixture is cold and frothy. Strain into glass (about 10-ounce capacity or larger), add some ice cubes or crushed ice, garnish with pineapple wedge and serve! ¹ Full disclosure: This honeymoon destination decision was heavily influenced by an episode of The Office. Plus San Francisco winter weather coupled with the hectic busy seasons of two financial statement auditors, yours truly and Mr. Sage. But mostly The Office. Not a recommended decision-making process!